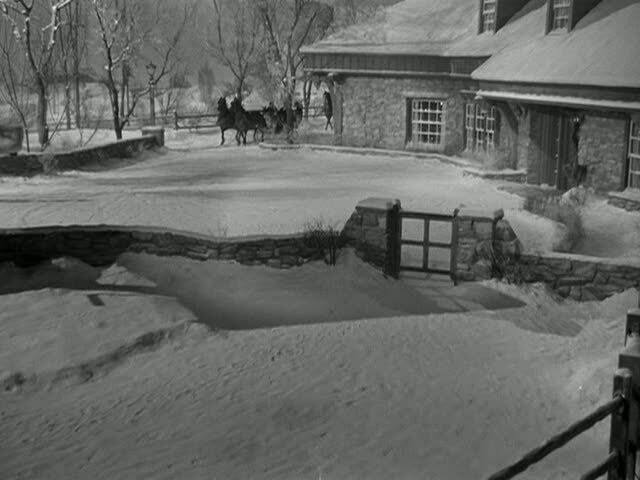 The Stone Farmhouse in "Christmas in Connecticut"
I love old black and white movies. Especially romantic comedies. And if there’s a little Christmas thrown into the storyline, all the better! 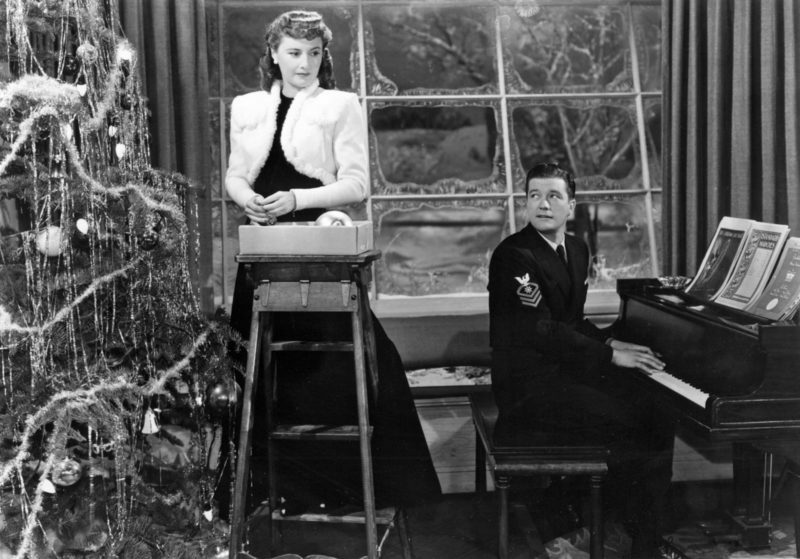 One of my favorites to watch at this time of year is Christmas in Connecticut with Barbara Stanwyck. Her “Uncle Felix” (played by Hungarian-born S.Z. Sakall) runs a successful restaurant in the city, and she uses his recipes for the magazine column. The Connecticut farmhouse she writes about is actually her architect boyfriend’s. And what a farmhouse it is! When her boss, publishing titan Alexander Yardley, invites himself to Christmas dinner and wants to bring along war hero Jefferson Jones as a sort of publicity stunt, Elizabeth and her boyfriend — now fiance — have to pretend to be married. Sadly, the farmhouse wasn’t real. It was built on a Warner Bros. soundstage. The curving stone fireplace is almost larger than life with the opening stretching above their heads. She brings “Uncle Felix” along to the farmhouse to cook, and they borrow a neighbor’s baby (for real!). 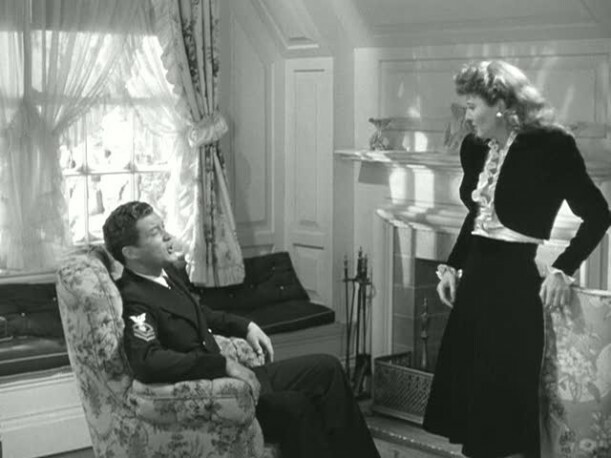 But then Elizabeth meets Jefferson Jones (Dennis Morgan) sparks fly, and complications ensue. 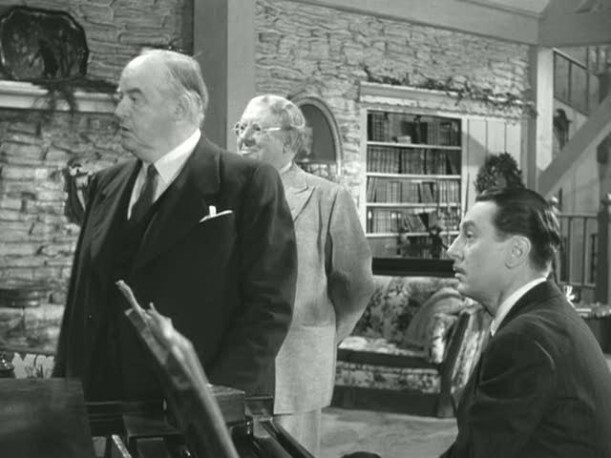 Sydney Greenstreet, a well-known character actor, played Alexandra Yardley, Elizabeth’s publisher. I love when he says, “What a Christmas!” at the end of the movie and can’t stop laughing. Elizabeth’s character was supposedly based on popular magazine columnist Gladys Taber, who lived on Stillmeadow Farm in Connecticut. But unlike Elizabeth, Gladys was the real deal who wrote something like 50 books about cooking and homemaking. Taber’s column was one of the Journal’s most popular columns ever, and in 1945, the monthly essay was nationally well-known and at the height of its success. Apparently during the war, copies of Ladies Home Journal were sometimes included in care packages sent to troops overseas, and my family has a wonderful fan letter sent to my grandmother from a WWII soldier who had read her columns while in the service, and wrote that the soldiers had found comfort in her portrait of hometown America. 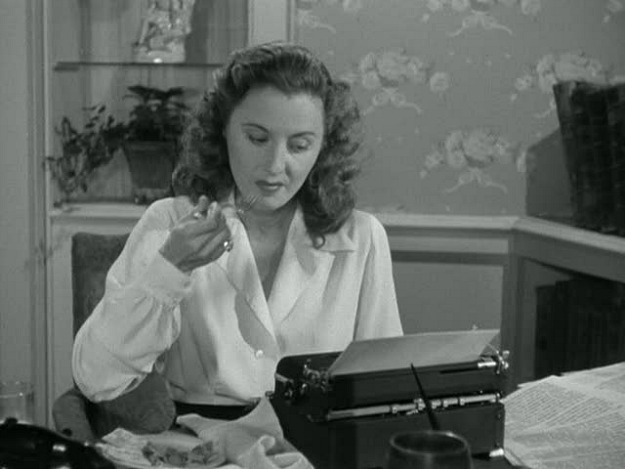 Beyond the basic plot point, however, the similarity ends — since Gram really lived on her (very simple) CT farm, and her cookbooks, while delicious, were not exactly low-fat — so she would have envied Barbara Stanwyck’s glamorous look! These are the kinds of outfits I like to hang out in when I’m in my (imaginary) Connecticut farmhouse, too! This may shock you, but everything gets straightened out in the end! The House From the Movie "Stepmom"
Jude Law's Mill House in "The Holiday"
One of my all time favorite B/W movies is “Mr. Blandings Builds his Dream House.” Most of the movie is about the house being under construction, so it probably won’t be considered, but I love it. Cary Grant was one of my favorite actors. Loved the cliff notes! I live in CT, and there is a converted barn/house for sale down the street. Will peek in during the next open house! Is it me, or does the living room look like it would a perfect retail space? I have been scouring the Internet for this farmhouse! I read yesterday that you were doing a piece on it and have been glued to the site ever since. My presents didn’t get wrapped until after midnight b/c I couldn’t pull myself away from this site. I absolutely love it here! Please rent Bringing up Baby and snap some more pics. I’m dying to see more! I feel in love with this house years ago from the Baby movie! Just dropping in to wish you a Merry Christmas!! HOw funny….haven’t seen this one in YEARS…however, we love Bringing Up Baby and just watched it last month…no wonder this house looked familiar! Enjoy your Christmas Julia!! We’ve so enjoyed visiting you this year!! My favorite old movie is Sabrina. Remember the amazing Larrabee family estate on Long Island, where Sabrina and her chauffeur father live above the garage? That’s where I wanna live. 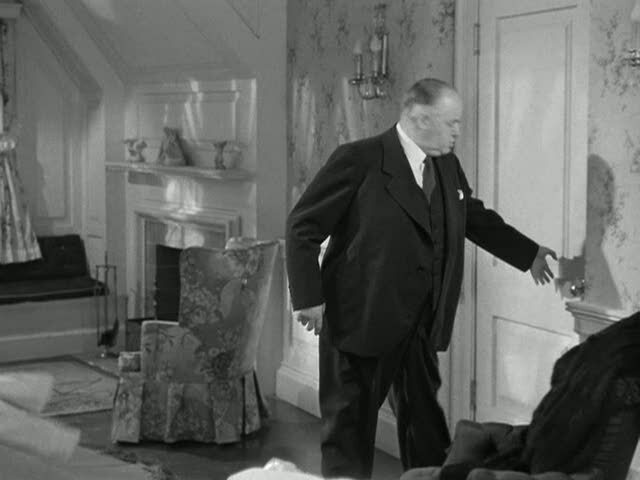 In the movie, Mr Blandings Builds His Dream House, there is a dream sequence. Murial dreams of a white colonial type home, I think, while Jim dreams of a hunting lodge, sort of half timbered and stone house. It’s Jim Blanding’s dream home that I would love to see more of. There were no interiors, just that shot of him standing outside. There is a home on the way to our daughter’s that I always call Mr Blanding’s house, because it’s very much like the one he dreams of. I was wondering where I had seen the Christmas in Connecticut house. Now you’ve solved the mystery. I like the house, very much. Enjoy your holiday! We’ll be heading to the lake early next week. We had a wonderful Christmas with our children, today. Thanks for this post, Julia. I just watched this movie for the first time a few months ago. My Mom said that the bathroom shown in the movie wasn’t very modern. Her mother built a bathroom during WW II in what used to be a coal room. It had a walk-in shower and a separate tub. Of course, my grandmother was particularly fashionable and it had to be very new! Julia, this is my favorite Christmas movie although I have been unable to watch it this year. I even did my own blog post about it at https://robinsblessednest.blogspot.com/2008/12/true-meaning-of-christmas-from-funny.html! Thank you for posting these pictures…what a beautiful house and pastoral setting. I would love to curl up in one of those chairs in the living room, wouldn’t you? I would love to know how you snap pictures while watching a movie…didn’t even know that was possible! Merry Christmas! I love that movie! The stone on the outside of the house is dreamy! And I too love to wear long dresses and fur shrugs when I hang out around the house. I hope we don’t bump into each other wearing the same thing. How embarrassing! If you love old b&w movies with an awesome house (lots of views of the house int he movie) and a holiday theme, you NEED to do a video tour the house in Holiday Inn. Best. Christmas. Movie. Ever. We watch it every Christmas Eve. 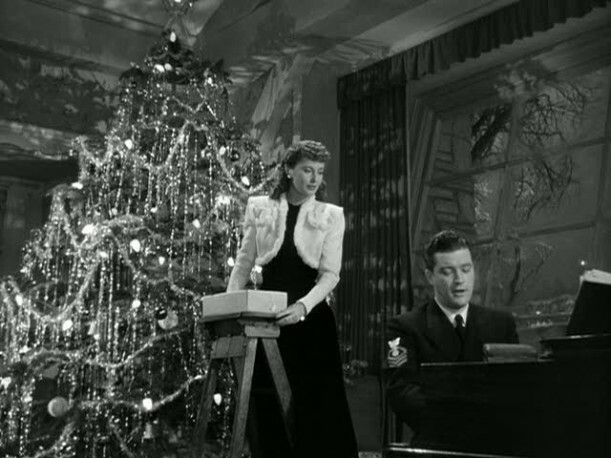 It’s the movie that the song White Christmas was first sung in. It’s got Bing Crosby and Fred Astair. What’s not to like? 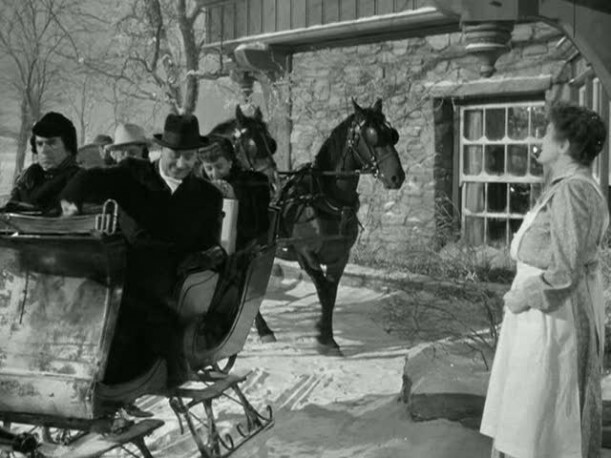 Interestingly, the farm house in Holiday Inn looks remarkably like the farm house the General owns in White Christmas (which IMO is a poor man’s Holiday Inn). Oh, and they do a movie within a movie thing, so you get to actually see the set, which thrills me. So many people have never seen or even heard of this movie. It distresses me. I’m on a mission to make everyone want to watch it. If you’ve never seen it, please do so! You will not regret it. Plus, the house! Dreamy! Hi Julia – I love the window by the piano and all the furniture of that era. A lovely old home ! And don’t you love the clothes they wore from that era ? Bring back the hat I say !! This is one of my all-time favorite movies! I’ve always loved the farmhouse in the film, and would love to build one like it someday (I may have to tweak the kitchen just a little, though). That fireplace in the living room is to die for! I just love old B$W movies as well. I hope that you and your family had a Wonderful and Merry Christmas! OH MY GOSH. You had me at Dutch door. Love this house. Also loved the one that Nicole Kidman lives in as the modern Bewitched. 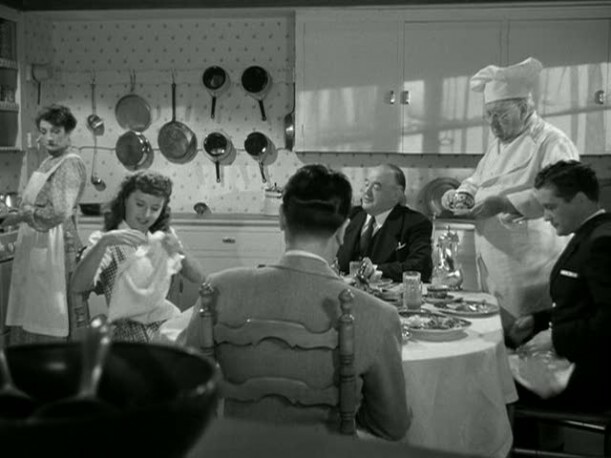 As well as Lucy and Ricky’s Connecticut house (minus the kitchen which I always thought lacked personality) and the house in the original version of Father of the Bride (1950). Gotta add, although it’s not a house. 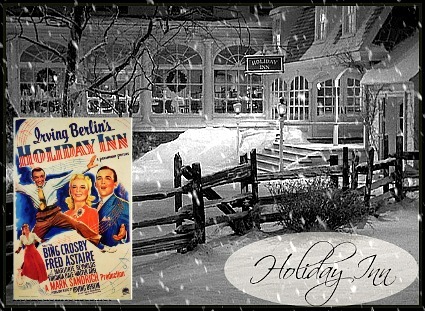 . . the Columbia Inn from White Christmas! I have just recently found this amazing “blog world” and yours is one that I love to pieces. I have always loved the houses in movies, pretty much more than the characters,but don’t forget TV houses. As a child, I wanted to live in the houses from “Leave it to Beaver”, “Donna Reed”, and “Father Knows Best”, and especially “Ozzie and Harriet”. The farmhouse from “I Love Lucy” was fantastic, too. Some of my friends think I’m weird, but I always notice the houses and decorating in movies, to the point that I kinda want to push the actors out of the way when they’re blocking my view. It’s nice to know that there are others out there that understand my “sickness”. Thanks and Merry Christmas! Thanks for sharing! I love the old movies! 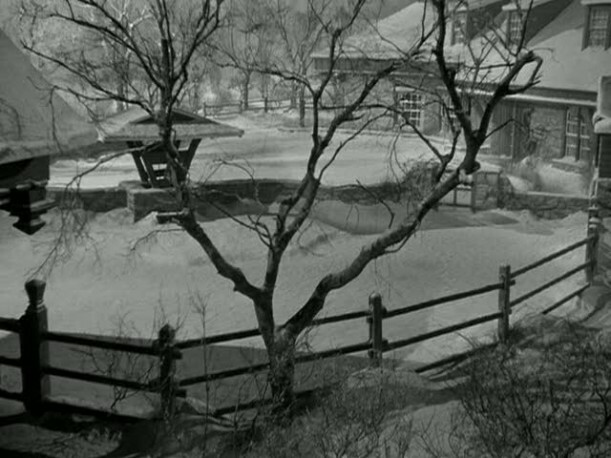 If I am correct, it seems that the house in “All that Heaven Allows” (Jane Wyman) is pretty cool for it’s time. And I’m sure the house from “Mommy Dearest” is pretty sweet too! I love that you posted all these photos from the house. I looked for them as well online when I posted for your holiday house tour but there were none to be found. I see I’m not the only fan of this great old film! Thanks for your scoop on your Wii. It helps subside my guilt. 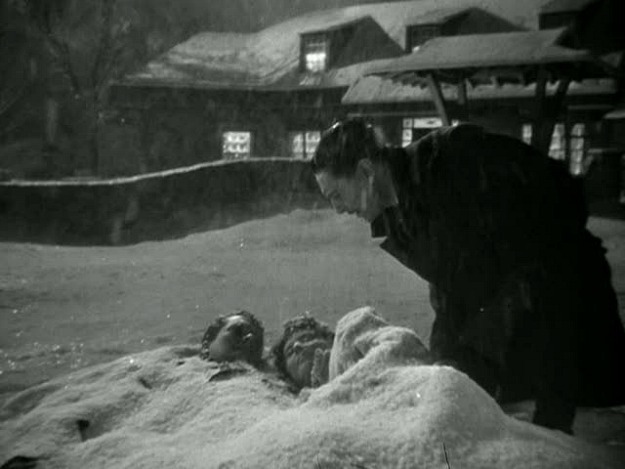 I’ll second the mentions of the inn from White Christmas! It’s been a LONG time, but I remember thinking the house in North by Northwest with Cary Grant was cool – one of those modern, mostly glass ones built into the side of a mountain. It wasn’t b&w, but I also got a kick out of the two houses in Christmas Vacation. The Griswold’s was a slightly more classic, while the neighbors’ was pure 80s “modern.” Thanks for the Christmas present, Julia! Merry Christmas Julia ~ I just thought that I would swing by and say howdy and wish you and yours a blessed and rest~filled holiday. Great post! I am know off to bake cookies and watch movies…two of my favorite ways to pass the time…besides blogging around the Universe. Thanks so much for these pictures. I, too, have always loved this movie and the house. It was wonderful getting to “study” it. All the old movies have great houses. They all seem to have huge bedrooms with sunny window seats and fireplaces in all the rooms. Yes, I do have a request. The farm house in the movie “The Great Lie” with Bette Davis. I LOVE that house. Her bedroom has a wonderful balcony that looks out on the back lawn. I’d LOVE to see this house. Thanks. LOVE your blog! This is my favorite so far. I miss the days of wallpaper and oval portraits and elaborate drapes. Not that I lived them, but you know what I mean! The house… set… reminds me of the house that Ricky and Lucy moved to in the Country… from I Love Lucy! Hope you are ENJOY this holiday season! Love these movie house posts! 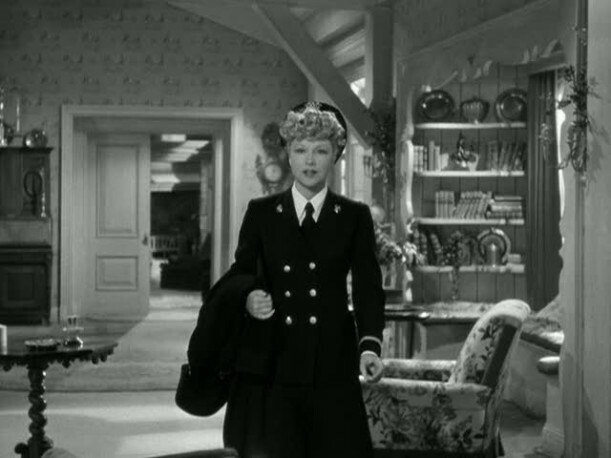 I want to suggest Mary’s country house from the orig The Women(1939) – her city house isn’t too shabby either! 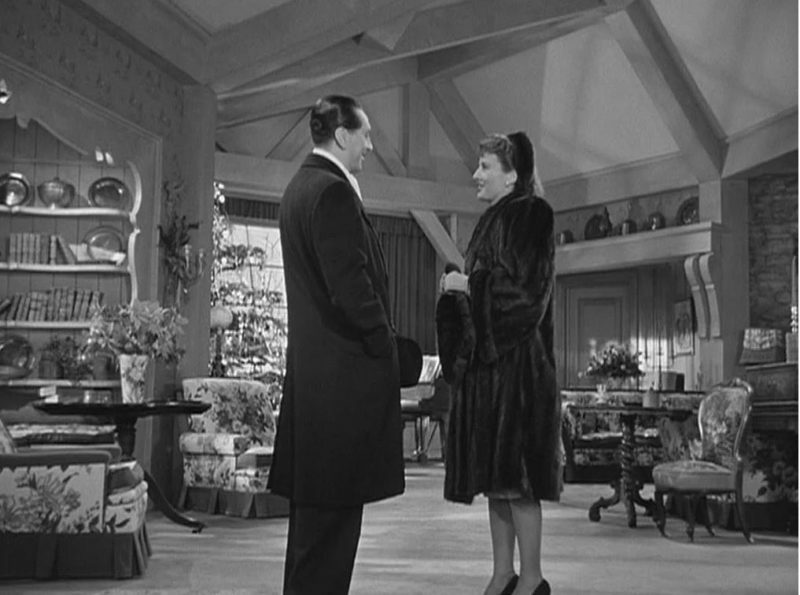 Also – how about Auntie Mame?… her apt decor corresponds with any new interest and changes many times thruout the movie. Great Post! I love old movies too! I think one of my all time fav’s is “Don’t eat the daisy’s” staring Doris Day-I am a big fan of her movies. My kids and husband say her personality (crossed with Lucille Ball) in her movies are just like mine-silly people I don’t know about that! Lol! Well maybe just a little-haha! But as I remember that was a very interesting home in that movie as well. Hope you and your family had a wonderful Christmas! Happy New Year Dear Blogging Buddy! This was one of my all time favorite movie houses too! But Mr Blandings Builds his Dream house is tied along with the house in Baby Boom!! And “The Father of The Bride House” … Did you know that they remade Christmas in Ct with Dyan Cannon in the 70’s? Her house was fabulous too! If you look very carefully at the original movie set, some of it looks like the CT. Living room and kitchen of Lucy and Ricky fame! Maybe they “recycled some components of it for the show?! Hi Julia! Merry Christmas!!! I’m so busy and so behind on blogs, but I enjoyed the tour of the darling stone cottage very much. I am a sucker for Dutch doors. Great house- wish it were real, instead of just “reel”! Best wishes to you and yours. I hope you had a great holiday, and an even more terrific new year, Dear Julia! i love that weve met, here in blog land!!! Thanks for doing this movie. One of the lesser know Christmas movies. Now do My favoriate. The Bishops Wife , with Cary Grant and Loretta Young. I vote for Holiday Inn too! Love that movie- and the house is to die for. My husband and I have joked about having someone design a house for us based on the movie- when we have the $$$ for it of course. Julia, I love old movies, too, and can’t believe I’ve never seen this one. It almost seems like a movie that could be adapted for today, huh? I’m trying to think of an old movie or two that I’d like to see more of, but I’m at a loss. Actually, “Sleeping with the Enemy” has a couple of neat homes. The first one is that contemporary beachfront property Julia Roberts shares with her mean husband. The second one is the little cottage she escapes to far away from said mean jerk. Awesome photo’s it sure looks like a cozy place to spend the holidays. How I wish I could have a holiday in such a nice place (of course if it was real).. thanks for these memorable pictures. Ive never seen this movie before, so I enjoyed the tour of this old home. So pretty and charming. I love the tinsel all over their Christmas Tree, no one uses tinsel anymore… why not? Sure it’s messy, but it’s oh so pretty! I love the name of your blog but really, you should issue a warning to go along with the name…..a girl like me needs to know that I WILL GET HOOKED on “Hooked on House”. Your blog is wonderful! I love these old movies as well but have not seen this one for quite a long time. I had FORGOTTEN how much I loved that outfit Elizabeth wears in the visit to the farmhouse scene. I want that little white jacket! Thank you so much for posting these pics. If we ever rebuild, this is the house for me. I had already bought both “Christmas in CT” and “Bringing Up Baby” just so I could drool over the house, but your putting photos on here is just great. I love the Blandings house and the “Holiday Inn” house, too. 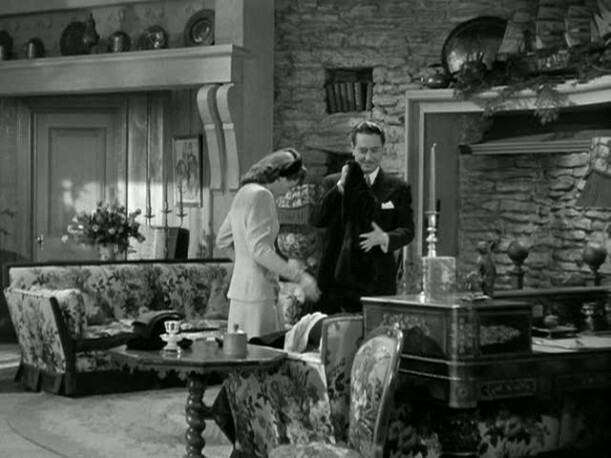 In fact almost any Hollywood set of farmhouses in the 30’s and 40’s are wonderful. I’m glad someone has posted something about this house! 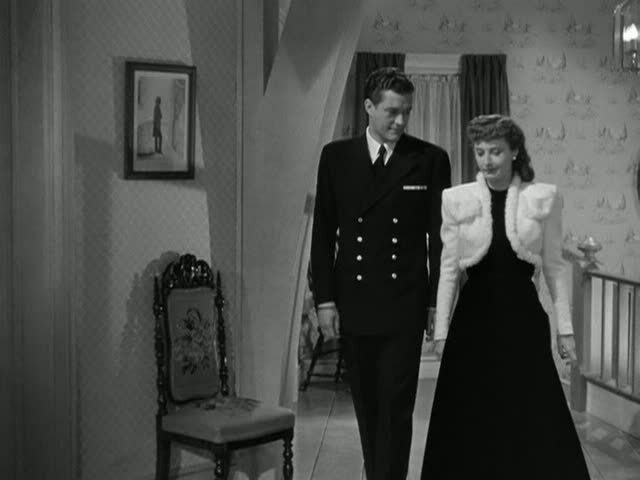 One of the best parts about black and white movies – after the crazy house dresses and hair the women wear as everyday attire – are the houses and their contents. 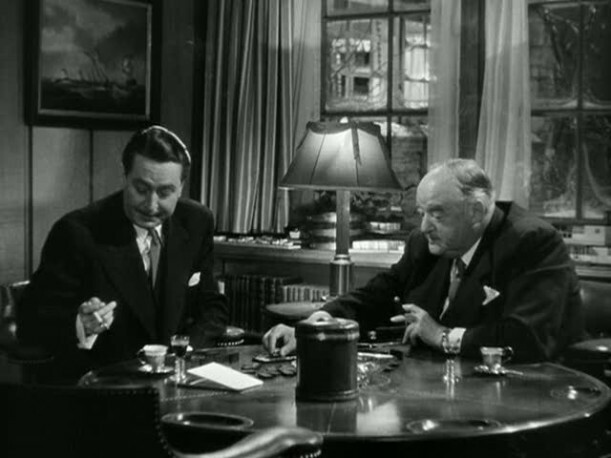 Since Mr. Blandings has gotten plenty of mention I’ll add Holiday Inn (before Bing turns it into an inn/club). My husband is a builder and each time we watch movies like this I’m constantly hitting pause so he can remember a detail as if they are able to be replicated in real life. I’m a fan of the house int he first season of the Doris Day show as well. Happy New Year and thanks for 340 great posts. 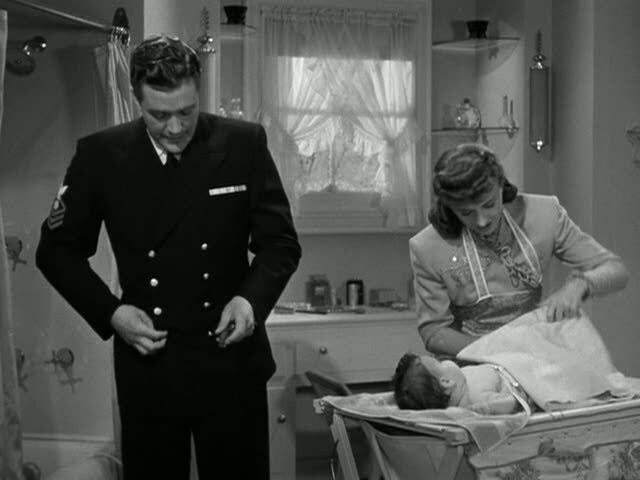 Does anyone know the real names of the two babies in the 1945 version of Christmas In Connecticut? I luckily found this thread trying to locate some information on the house in “Bringing Up Baby” and “Christmas in Connecticut”. As seems to be the consensus here, I think that’s a great looking house! It seems to me to be a timeless design, and would work just as well with a very contemporary interior as the more rustic look found in “Baby”. I also agree the interiors between “Baby” and “Connecticut” do not look like the same house, and I wouldn’t be surprised if it was completely different from one film to the other–perhaps it’s just the exteriors that are the same? I can also shed a bit of light on two of the other houses mentioned in this thread, those being the house in “Mr. 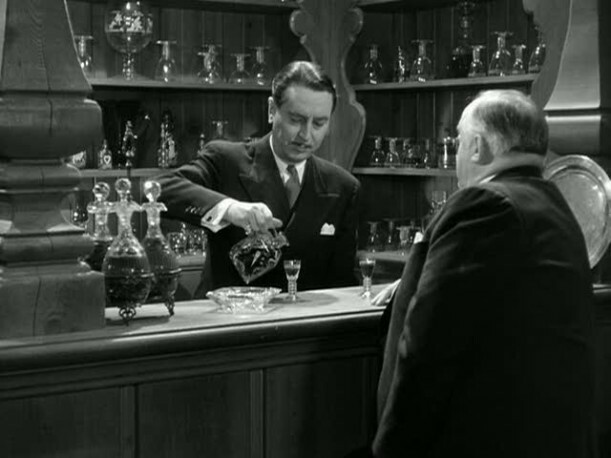 Blandings” and “North by Northwest”. The NbyNW house was pretty much a matte painting, with some of the base of the house and the cantilever beams constructed for Cary Grant to climb around on. It was designed to look like a Frank Lloyd Wright house, which, before I learned tht the house never really existed, is what I thought it might have been! The Blandings house (at least one of two that were constructed–one for the “finished” home and one for the “under construction” home) still exists. It’s used as a park headquarters building in Calabasas, California. And immediately to the west (maybe a mile or so?) is the location of the set of MASH (the TV series, not the film AFAIK. If anyone lives near there and can get some shots of the current state of the house, it would be great to see them posted somewhere! I’ve searched Google as thoroughly as I can without any success. 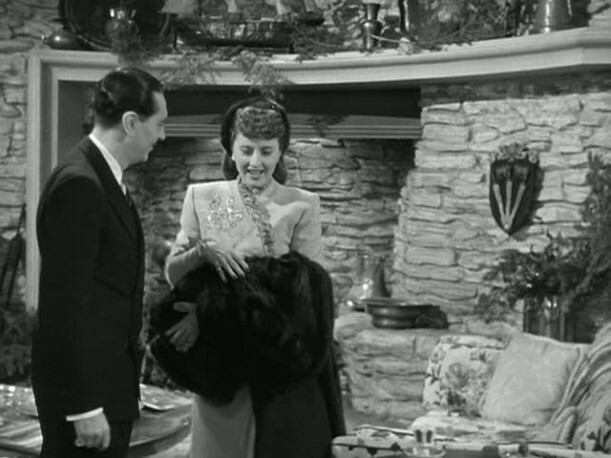 I also love the house in “Holiday Inn” starring Bing Crosby. One of my favorite interiors is the apartment in “Eyes Wide Shut” with Tom Cruise and Nicole Kidman. 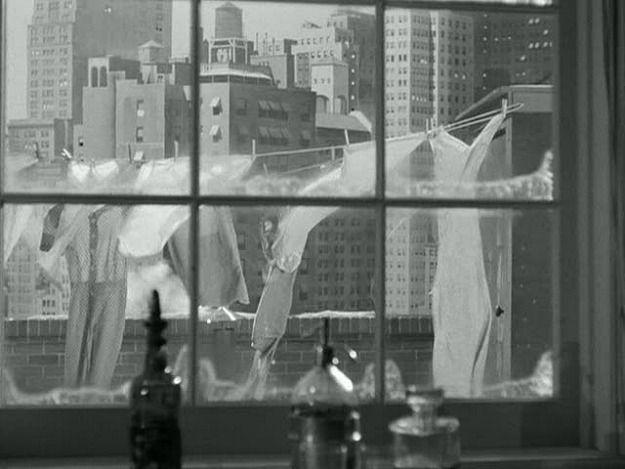 Strange movie but wonderful set decoration for their apartment. I wonder if this set is the same as the movie Leave Her to Heaven with Gene Tierney? 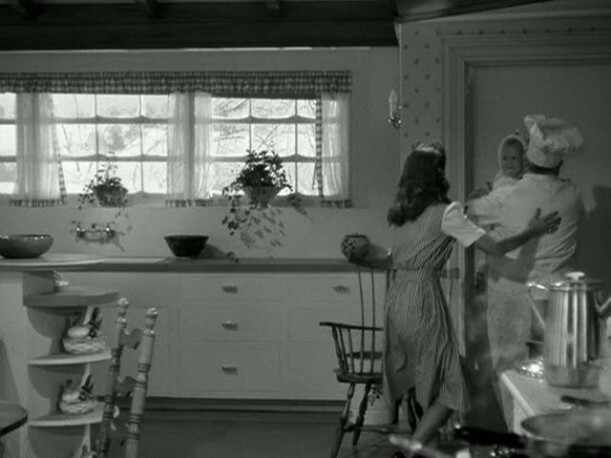 I love movies with sets designed in something called “Connecticut Farmhouse vernacular”, best examples found in “Bringing Up Baby” and “Swing Time” both made at RKO about 1937, I think they re-worked the set for use in both films. There’s great stonework, whitewashed beams, and dutch doors everywhere. I like “Christmas in Connecticut” sets too. It was made during the war at Warner Brothers, so it’s not likely to have re-used the sets from RKO. 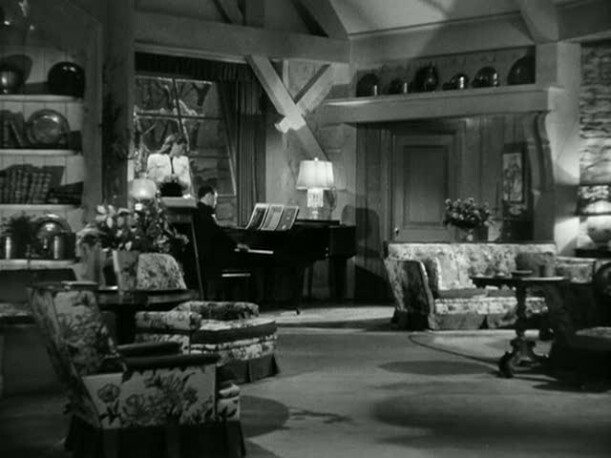 “Mr Blandings”, “Holiday Inn” and “Imitation of Life” all have great sets in the CFVernacular. Last week I visited Connecticut and saw in person a house very close to my ideal: Hill-Stead Farm in Farmington, Ct • https://www.flickr.com/photos/7384797@N02/3972985679/ and it has a great story behind it. It was designed in 1898 by a young Theodate Pope for her wealthy parents to house their Impressionist art collection, still inside for public view today. Built on the top of a hill, it’s full of dutch doors, terraces, molding details, great views and landscaping. The side entrance looks like it inspired the set in “Holiday Inn”. Some years later she survived the sinking of the Lusitania. 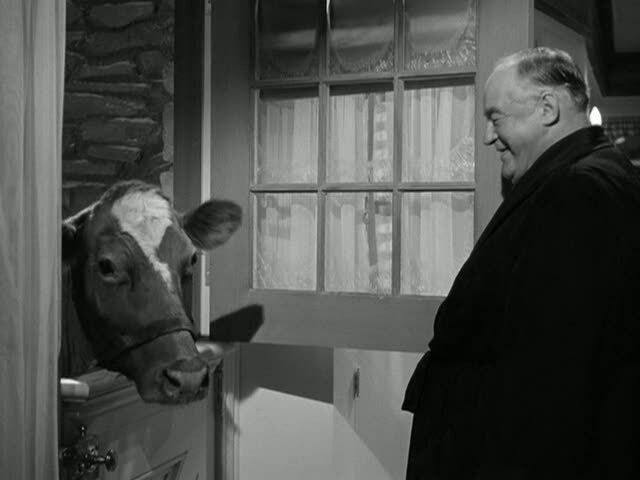 Just thought of one more film in the Connecticut Farmhouse vernacular: “Invitation” 1952 MGM starring Van Johnson and Dorothy McGuire. It’s a chic flick. She’s an invalid about to kick off at any moment. He’s a young architect who redid an old barn so the interiors are pretty nice, timeless in my opinion. The exterior is an ugly back lot contraption but the studio set interiors are great. If you are into staircases, the best one belongs to “Auntie Mame”! Once in Architectural Digest I saw a photo spread of Jack Warner’s house and it has a staircase almost identical to this one. Isn’t that curious. 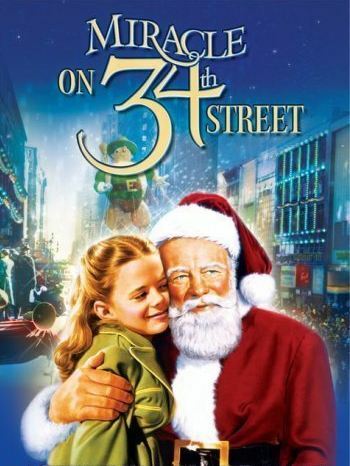 Love this Christmas movie from the very first time I had seen it (many years ago) – I would move into this house today, if I had the opportunity. It is cozy, roomy, great details & not too big – get the fuzzies just looking at it. Love the “Blanding House” also. Thank you for posting, what fun! 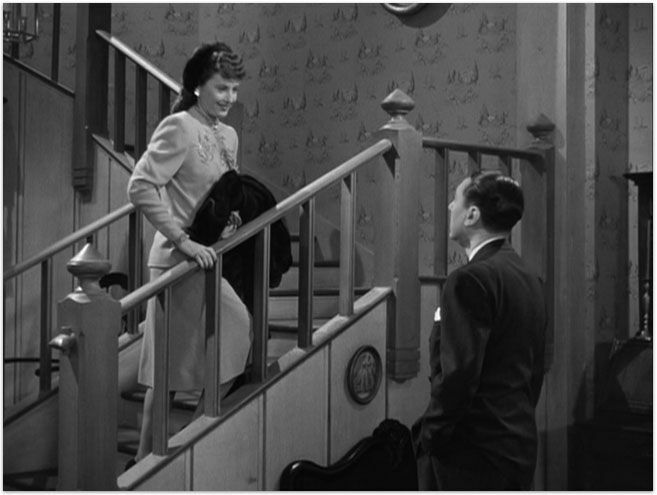 Here is the link to the YouTube I posted showing the “Auntie Mame”staircase in 6 or 7 other films. Enjoy. .-= Richard Orton´s last blog ..Gisela May – Kessel Buntes 1981 m. Fernsehballett – Mame =-. I love your site!!! I thought i was the only house nut out there. I would love to se you add the Jumanji house , Please dont eat the Daiseys, Antie Mame. I have covered “Please Don’t Eat the Daisies” and “Auntie Mame,” and you can find the links here: https://hookedonhouses.net/houses-onscreen/. What a lovely site! Just a quick note regarding Gladys Taber’s magazine column as a possible inspiration for this movie: Taber was my grandmother, and my family still owns Stillmeadow Farm. But I have to correct Susan Turnley’s post a bit, since my family actually has always believed- and hoped- that the movie was indeed loosely based on my grandmother’s Ladies Home Journal column “Diary of Domesticity”(I know, what a title). We’ve never tried to pin this down, however, so we’d welcome any confirmation/thoughts. Taber’s column was one of the Journal’s most popular columns ever, and in 1945, the monthly essay was nationally well-known and at the height of its success. Apparently during the war, copies of Ladies Home Journal were sometimes included in care packages sent to troops overseas, and my family has a wonderful fan letter sent to my grandmother from a WWII soldier who had read her columns while in the service, and wrote that the soldiers had found comfort in her portrait of hometown America. 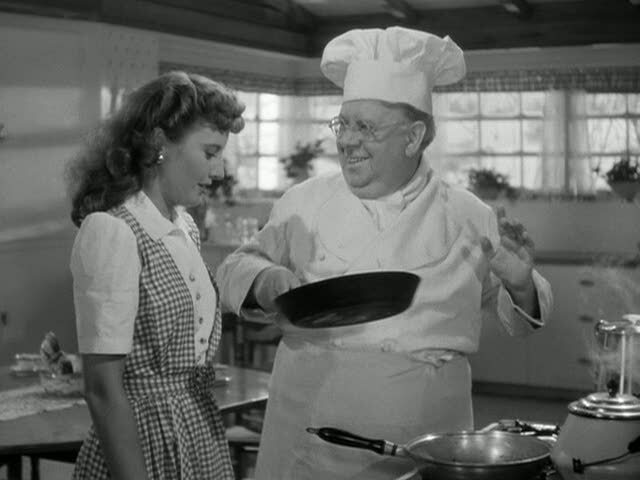 Beyond the basic plot point, however, the similarity ends– since Gram really lived on her (very simple) CT farm, and her cookbooks, while delicious, were not exactly low-fat– so she would have envied Barbara Stanwyck’s glamorous look! 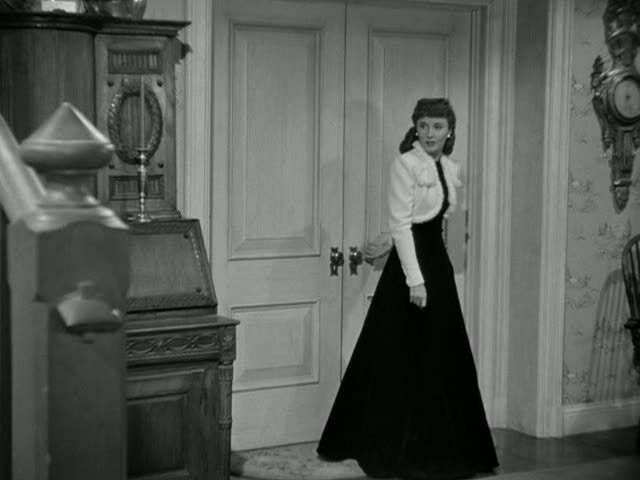 Again- enjoyed this site– Anne C.
interesting that we have the same name and are both deeply in love with the house from Bringing up Baby — saw it again last night on TCM and was frustrated that the camera moves so quickly in the scenes that you don’t get time to drink it in. 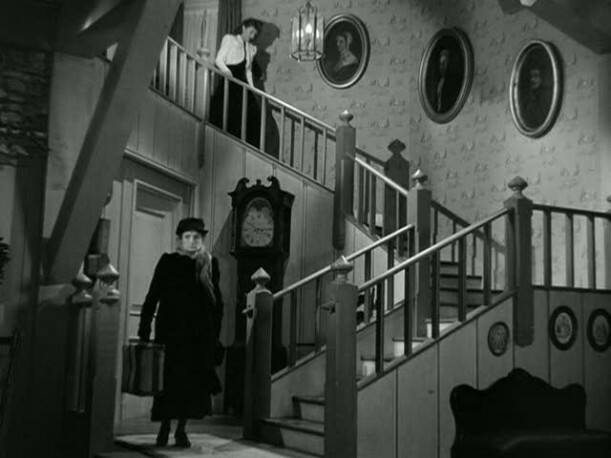 The difference in the houses’ staircases is that the one in Baby is metal and stone, not traditional wood. If anyone ever finds out more about this set I’d love to hear about it! I watched “Leave Her To Heaven” the other day and would love for you to get pictures of the inside of that house. It is absolutely divine! Just read Ann Colby’s post. I adore the Gladys Taber books and got my best friend reading her, too. She always made us want to clean our houses–not something we usually want to do! She must have been a lovely lady. Hello! I know it’s late to posting a comment on this blog. I noticed that the other comments where dated 2008. I had stumbled across your blog while researching if it was too early to start decorating for fall today! I have found that a lot of people have beat me to it… Well, I love the house featured in this blog from “A Christmas in Connecticut! I could only dream of home to such a gorgeous house! LOVE LOVE LOVE IT! Love your blogs! Thank you! Great post. I only wish the photos included one of the fireplace. Though I couldn’t find such a picture through Google images when I looked. I just watched the movie again tonight and found this post while looking for background information about the movie. Thanks! Love those shots. That fireplace made the house, in my mind. I knew it had made an impression on you, too, as you had mentioned it early on in the original post. 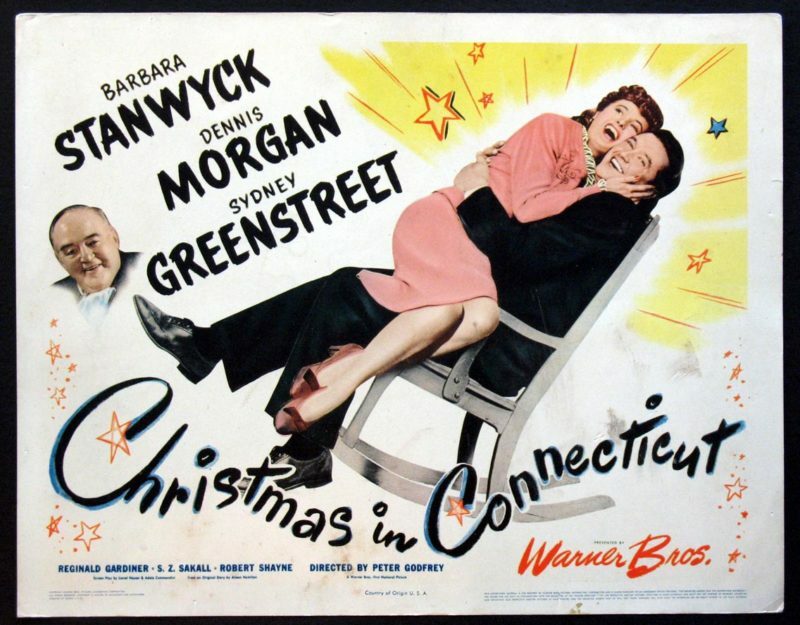 Found you when I asked Google “when can I watch Christmas in Connecticut? !” This is my favorite EVER movie. Thank you for the stills of the house! I am SO happy to know the Gladys Tabor connection. I suspected so after reading Still Meadow Seasons (which I found in a 25cent pile at a used book store a few years ago – it was rather weathered) I was an instant fan! I have collected quite a few for my “snow pile”. I recently moved to Vermont after living most of my life in California. I am looking forward to making my way through the collection and the cook book. How exciting to know that Stillmeadow Farm is still owned by the family. I was hoping that it was open for tours by now. It’s on my bucket list! Merry Christmas. 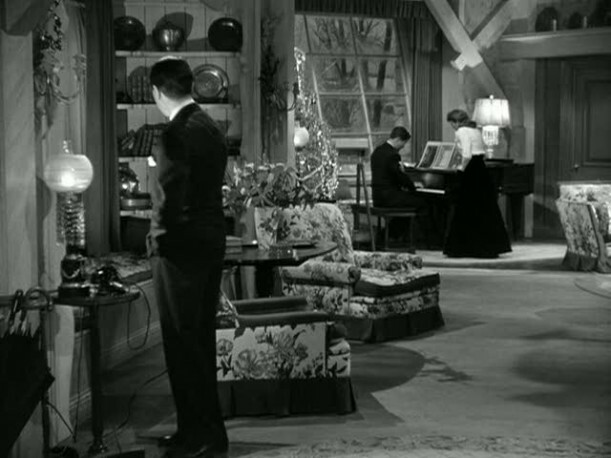 I still think the house in Holiday Inn is the BEST ever–I watch the movie several times every Christmas and have been thinking of building it since my childhood. It is warm and inviting and so Connecticut. The epitome for me. I also like cottages and love Joseph Cotton’s english cottage in the Movie Love letters with Jennifer Jones. It is also very very charming-small but charming with all the bells and whistles–in 1947. Three of my favorite houses are : #l. Lucy & Ricky in Connecticut (Westport) l957. 2. l939 version of “The Women” in Norma Shearer’s house on L.I. OMG! So glad there are others who loved this movie and loved this farmhouse! However, I am a little confused. Has it been said exactly where this farmhouse was, who it belonged to, and who designed it (assuming it is real)? I could not be sure from the description of the film whether or not this farmhouse was Stillmeadow Farm (Taber family) or something else. But, oh yes! absolutely a fabulous house! It would do my heart good to learn it was/is the real deal and any facts about the house. Thanks for a great (and super fun) blog! Sorry for the confusion. I don’t think the farmhouse was real. It was just a set built for the movie. 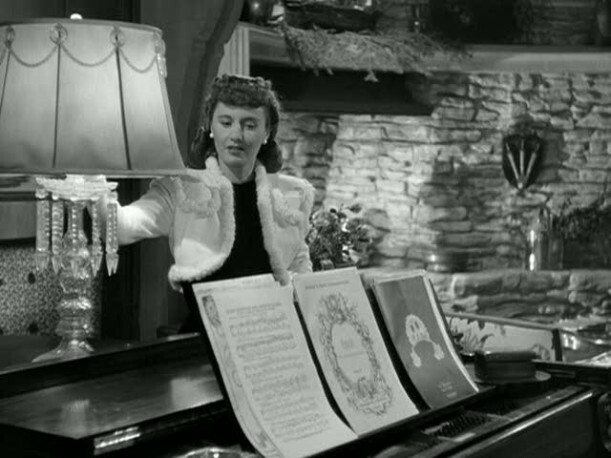 Rumor is that Barbara Stanwyck’s character was based on Gladys Taber and her farm. Others dispute that. But I know for sure that this wasn’t actually filmed at Stillmeadow Farm. I’ve seen photos of it and it looks very different.